Are you searching for answers to a question? Do you need fresh ideas to respond to a challenge? Are you looking for new ways to build community and foster teamwork in your classroom? Are you exploring new strategies for a lesson? Do you imagine lessons where students do more of the talking and learn from one another? Did you answer yes to one of the questions above? 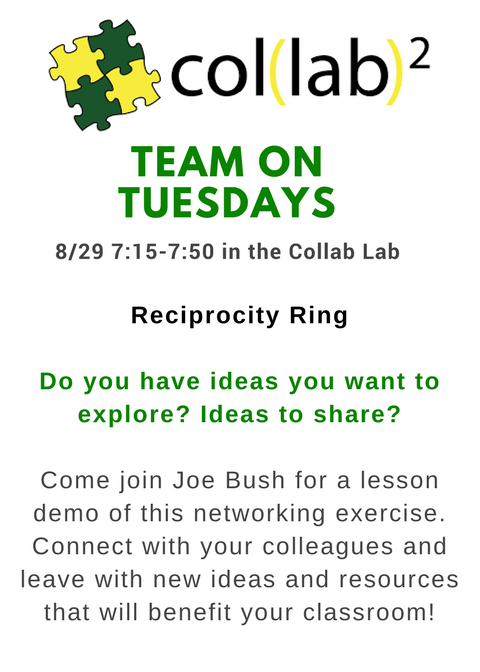 Then the Reciprocity Ring Exercise could be for you! Joe Bush led us in this team-building and problem-solving activity for our second Team on Tuesdays. You can learn more about this weekly learning exchange series from our previous post: Connect with Students from the Start. First Joe explained the concept for the activity and how it has been used in business for brainstorming and problem-solving. He then shared how he has used the exercise in his Leadership Through Service class. The students posed questions and leveraged the ideas of their peers to share answers, solutions and resources. After doing the activity with his students, he realized how valuable it could be for teachers to use in their classes. 1) Write one or two questions on the wall. 2) Rotate to read the questions of your peers. 3) Share ideas or resources. 4) Continue rotating to learn from the ideas and responses of peers, and add any new ideas. What will be your next steps? We left with new ideas, solutions and resources to our own questions. We were inspired by the questions and responses of our peers. 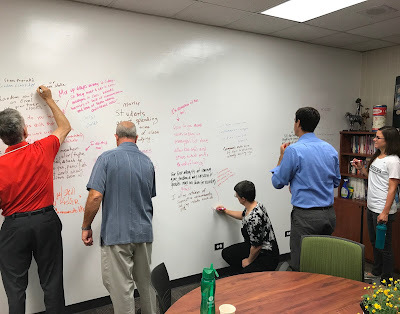 We brainstormed ideas for using this same activity in our own classrooms to foster a learner-centered environment; to get our students collaborating with their peers for answers to questions or solutions to problems. We established new connections with our colleagues. We made plans for follow-up conversations and connections in each others' classrooms. See the video and photos below to get a better idea of what the activity looked like.